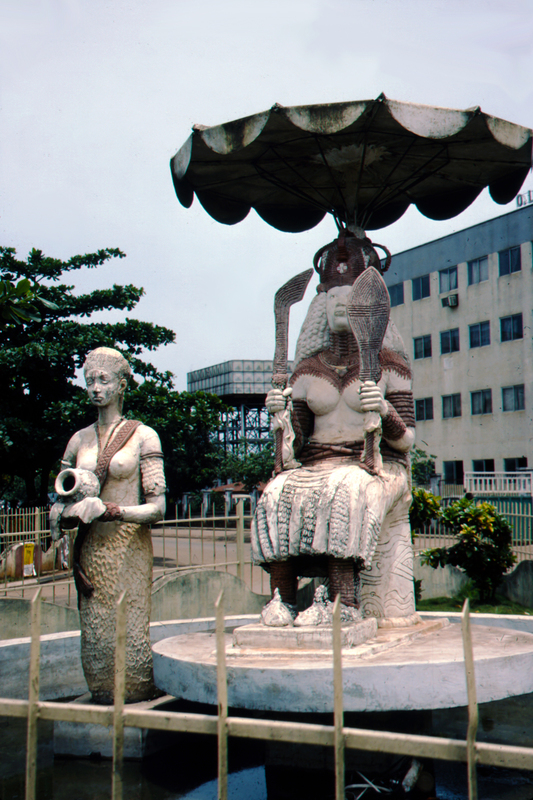 This pool-based figure with mermaid attendant, created by Felix Idubor, embodies the complexity of water spirit beliefs in Benin City. It depicts a bare-breasted crowned and enthroned female holding both ceremonial swords, the ada and eben. She is shaded by a huge parasol if a type reserved for use by monarch or his chiefs, and her plethora of coral beads marks her as no ordinary individual. As Gore and Nevadomsky have pointed out, citizens identify her as Mami Wata, Olokun himself (despite the ocean deity's masculine gender), or one of Olokun's many wives. The work's site has been treated by some devotees as a shrine, with sacrifices placed around it, to the consternation of other citizens.